Renting a limousine can be a confusing process. With so many options, providers and personal needs – finding the right limo rental for your needs can be an overwhelming feat. Here is a basic guide that will help you dig through the clutter to help you find the perfect limousine for your event! What kind of car do you need? Are you going to be transporting 2 people or a group? Are you looking for something that serves as a way to arrive to your special event/location in luxury, glamour or as a party on wheels. If you are looking for a Wedding Limousine – you may want something more classic just for the 2 of you like a 1957 Rolls Royce Princess or if you would like to have the whole bridal party arrive in style and comfort, then the 12 Passenger Audi Q7 might fit your needs better. Limousine rentals can be pricey, but by focusing on what your exact needs are you can keep your rental needs in line with your budget by making sure you rent a limousine that has all the features and space you need with out the extra! Unlike other limousine rental companies, we do not offer service level pricing as we believe every customer should be treated equally! So be sure that when you do your research you compare not only the model of limousine you are looking for, but the services that are provided. Be sure to check for hidden add-ons like built in tips for drivers, fuel surcharges, tolls and other hidden expenses that some limousine companies do not tell you about before renting your limo. Check for package deals! 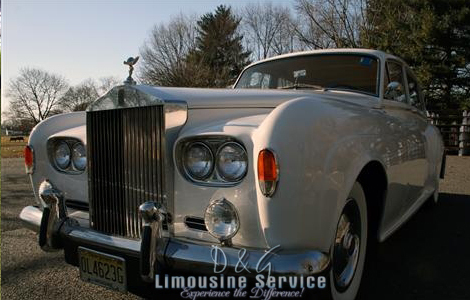 Many limousine companies offer package deals to their most common areas of services such as NYC, Atlantic City or local wedding venues . Since many limo rental companies have limited vehicles, it is important to book your car rental early! If you know you want a Dodge Challenger Stretch Limousine to take you and your friends to the prom – then booking far in advance will ensure you get it! There is only 1 of those vehicles here at D&G Limousine – and there may be other local limo companies that have one, but they go quick! If you do not think in advance about your reservation, you will miss out on having the limo rental of your dreams. Unfortunately, as with just about any business, there are some limousine companies that may not be registered to do business in their state. They may not even be hiring licensed drivers on some cases. You need to be sure when you hire a limo company that they are registered as a legitimate business with their state, that they have proper insurance coverage and that their drivers are properly licensed. Any reputable limousine company will be more than happy to share these items with you – if they choose not to or seem apprehensive, then you may want to look at alternate companies.